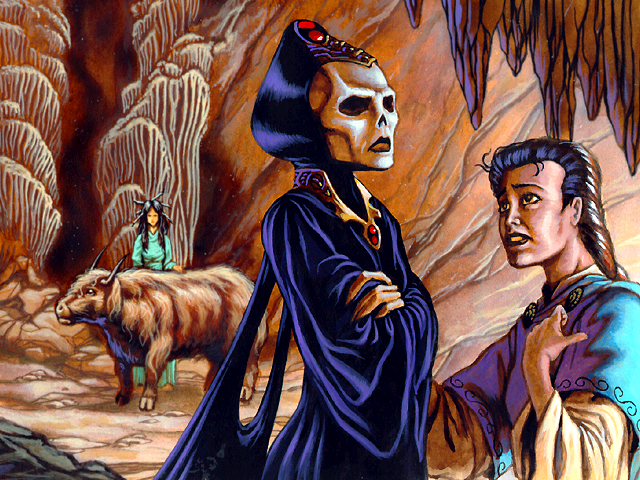 Dorasa goes further into the tunnel, where she finds the cavern of Ernalda's terrible aunt, Ty Kora Tek, goddess of the dead. Ty Kora Tek has been collecting dead souls in her cavern. During the troubles with Daga, Uralda and Esra wandered in, seeking protection. Dorasa asks Ty Kora Tek to release the two bountiful goddesses. But Ty Kora Tek refuses: "What comes into my realm cannot come back out again. I cannot set a bad precedent now and just let out anyone who has a good reason to leave. Very bad times are coming, the halls of the dead will soon be full to bursting with the slain." -"Esra and Uralda will disturb things here, making life where there should be death." -"Take others of the storm tribe in exchange for these two." 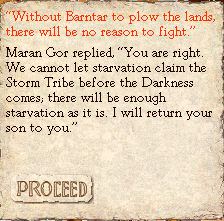 -"Without Esra and Uralda, the people will starve." -"You are my aunt, you must listen to my pleas."